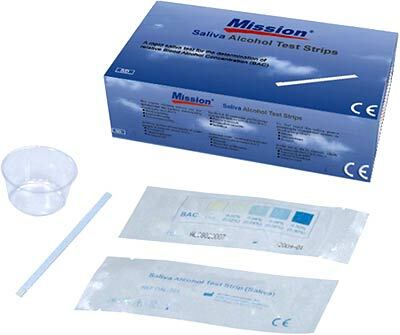 The Mission Saliva Alcohol Test Strip is a screening test used to semi-quantitatively measure alcohol in human saliva. 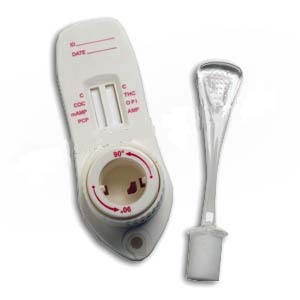 The test strip indicates relative Blood Alcohol Concentration (BAC) at 0.0% and 0.02% cut-off levels. Results are used in the diagnosis of alcohol intoxication. For in vitro diagnostic use only. The test is a firm plastic strip with a test pad attached at the tip. The test pad contains chemicals that are highly sensitive to alcohol. Alcohol in saliva reacts with the chemicals to produce a color change on the test pad. The color change depends on the amount of alcohol present. The results are read by comparing the color of the test pad with the color chart. Two BAC (Blood Alcohol Concentration) Levels are available: 0.0% BAC and 0.02% BAC. The 0.0% BAC Saliva strip test uses the lowest cutoff level, meaning it is the most sensitive to alcohol. This is a better option for a zero-tolerance testing scenario. Store as packaged. Keep the test strip in the sealed pouch until use. Store in a dry place at 2-27°C (36-81°F). DO NOT FREEZE. Do not use past the expiration date. NEGATIVE: No color change appears on the test pad. There is no alcohol present if the color of the test pad matches the negative (-) color block on the pouch. INVALID: A slight color change appears on the edges of the test pad, but no color change appears on the center of the test pad. Repeat the test with a new test strip. Ensure the test pad is completely saturated with saliva. Contact your distributor if the problem continues. The Mission Saliva Alcohol Test Strip is a screening test. It cannot detect exact BAC. Confirm results with an approved alcohol test before taking legal action. The test should not be used to determine if the user is capable of operating machinery or driving. Actions of any person, based on the outcome of the test, are at the person's own risk. Alcohol impairs judgment. The test should be performed by someone who is not under the influence of alcohol. Failure to wait 15 minutes after the last alcohol intake, or to drink a glass of water before testing, may cause false results.